Currently, the state of Wisconsin has a tool that measures how prepared high school students are to attend college. The tool measures standardized test scores and more. However, those indicators aren’t necessarily representative of all the skills a high school student may need to be successful after high school graduation. 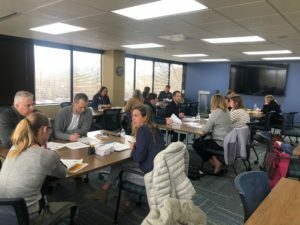 The Waukesha County Business Alliance and the Waukesha County Center for Growth developed the Workforce Readiness Dashboard to measure how well schools are preparing their students for college, a career and life. A committee was formed to develop the dashboard, made up of educators, business leaders, public officials and nonprofit and community leaders. The academic measurements for college skills can be used to predict student success in a two- or four-year college program. The measurements include GPA, ACT scores, percentage of students who completed college credits in high school and percentage of students who were accepted into a two- or four-year college or university. The career skills section measures the percentage of students who had access to and took advantage of opportunities that connect classroom learning with a student’s interests and career aspirations, transform the high school experience and provide context for learning. Opportunities include career exposure activities, work/career-based learning experiences (internships, co-ops, mentorships, job shadows, etc. ), earning industry certifications prior to graduation, joining the armed forces and more. The life skills metrics evaluate a student’s growth mindset, perseverance to achieve goals, self-reliance and connection to a community. These skills can translate to success in many facets of life. The measurables include attendance rate, completing financial literacy courses, participating in school-sponsored activities and completing community service. Each school district’s dashboard for the previous full academic year will be published on the Center for Growth’s website at the beginning of each calendar year. The Alliance and Waukesha County schools are focused on making sure our high school graduates are prepared for all the opportunities that exist for them after high school, whether that involves going straight to a higher education institution or joining the workforce right away.